Energy Dynamics: The Pot Calling The Kettle Black? It appears that The Alliance for Solar Choice (TASC) is ramping up its efforts to oppose the HECO-NextEra merger through its intervention in the merger docket and a "local" effort called KULOLO (Keep Our Utilities Locally Owned and Locally Operated). First of all, let me clarify - I am neither for or against the merger nor am I for or against rooftop solar or distributed generation. However, I am pragmatic and concerned that people are reacting emotionally and taking positions and making decisions that may not be cost-effective and provide only short-term gains for a few. The guerrilla tactics being used by these two entities through the press and social media only detract from real issues, the technical and economic challenges that Hawaii's electric systems face in transforming a system to benefit all. Are TASC and KULOLO acting in the public interest for the public good? I'm not sure, but it sure looks and smells like corporate business as usual to me. With the Sierra Club as the "local" front man, it's just a move to increase rooftop pv market share and a promotion of self-interest wrapped up as democratization of power generation. I cannot help but feel that Hawaii is being used as the poster child to preserve net metering programs and what happens here will influence and affect these companies' profitability nationwide thus their active interest, concern and the distractions. Access to Demeter's financing is the key you've been looking for to unlock your sales potential . . . We will help you close the deal. Silevo - is a photovoltaic (PV) solar module manufacturer that, according to a June 16, 2014 SolarCity Blog, had signed an agreement to be acquired by SolarCity. SolarCity has been a growth machine, doubling installations every year for the last five years to a projected 920 MW-1 GW this year. But it hasn't been able to make a profit. In 2014, net loss attributed to shareholders was $56.0 million, and there's no end in sight to losses. Bulls will argue that retained value of $2.4 billion will eventually turn into profits, but that number includes some rosy projections, and if any of them fail to come true, the stock could plummet. Solar Universe - Solar Universe is headquartered in Livermore, California and "uses a franchise model in which it provides a national network of locally owned and operated solar installers with training and support. The franchise has over 32 locations in 9 states." Sunrun - is the largest dedicated residential solar company in the United States. Verengo - Green Tech Media Research identified Verengo as the third top installer in the U.S. residential solar market in 2013. 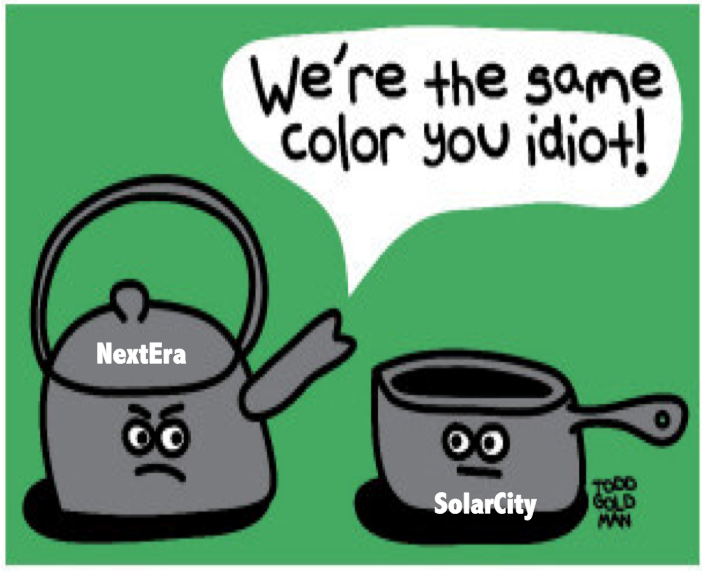 ZEP Solar - According to the Motley Fool this was SolarCity's greatest move and the one you didn't hear about. In October 2013 SolarCity acquired ZEP Solar, a company which specializes in manufacturing mounting and grounding equipment for panels. If you all think that TASC and KULOLO are promoting rooftop solar for purely altruistic concern for Hawaii start following the money. The only way they grow their market is by impacting the supply side of the electric system equation and, given the present situation in Hawaii with generous tax credits and net metering, that means shifting the cost to the majority of electricity customers until there are correct pricing signals and valuation of services to the grid. Pot calling the kettle black? 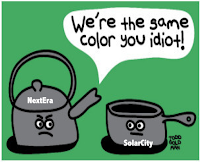 It was hard to go through each businesses' website to get financial information, however, SolarCity is a publicly held company. I'm sure they try to deliver a profit to its shareholder not unlike this TASC statement about NextEra and, given what financial analysts have written, no wonder it has been taking such an aggressive approach to grow its market share. It appears Sunrun and Verengo may want to satisfy their venture capital and equity investors too. The company raised $12 million in venture capital funding from a group of investors including Foundation Capital in June 2008. In 2009, Sunrun closed a Series B round of funding for $18 million led by Accel Partners and joined by Foundation Capital. The company also received an additional commitment of $90 million in tax equity from U.S. Bancorp in 2009, following the $105 million in project financing from the bank in 2008. In June 2010, Sunrun struck a deal with PG&E for $100 million. Following the deal, the company announced $55 million in fresh capital from Sequoia Capital. In May 2014, the company closed a $150 million equity round that will be used to improve its technology in the U.S. solar industry. The firm received $9.7 million in venture capital in 2011 and an additional $12.5 million in 2013. In 2011 the company moved its headquarters to Torrance, California. By 2012, the company was one of the eight hundred fastest growing companies in the United States according to Inc. Magazine, with a revenue of over one hundred million dollars that year and more than seven hundred employees. . . It was announced in early 2015 that NRG Energy had acquired the New York market of Verengo Solar. The move allows Verengo to re-direct its focus back into its core California market. The local effort to stop the big corporate takeover isn't so "local." And if you think local ownership is the panacea you are living in la-la land. Sorry to be so harsh but this lack of understanding of what is happening to our electric system is serious and cannot be left to the un- and ill- informed. I already contacted John Farrell to suggest that he read and comment on your blog. ILSR is responsible for this Nextera Postcards From Florida, seen by ratepayers all across the state. Mr. Farrell recently asked me what other information our ratepayers need to know if ILSR should produce another video to help us. Let's not forget that Hawaii would not be in this mess today if the PUC carried out its 1913 prime directive to insure that there would never be a utility monopoly in Hawaii. We would have had publicly owned, non-profit power decades ago and would truly be following in the legacy of King Kalakaua and Queen Liliuokalani. HECO is NOT following in their legacy.